VISALIA – The final curtain has fallen for a children’s theater company’s productions at the Main Street Theater. On Sept. 6, the Visalia City Council informed the Enchanted Playhouse Theater Company (EPTC) that the City would not accept the theater company’s formal offer to purchase the theater building at 307 E. Main Street because the offer did not meet any of the City’s minimum terms. In a letter to EPTC’s attorney Christopher Campbell, City Attorney Alex Peltzer explained that the theater company’s offer was considered “non-responsive” because it ignored the city’s concern of financing the purchase and was below the appraised value, which would have constituted a “gift of public funds” if accepted. During a closed session negotiation at the Sept. 4 City Council meeting, EPTC offered to purchase the Main Street Theater for $300,000, the appraised value of the building. The offer was $150,000 short of the City’s minimum asking price which the theater company called “unreasonable” and a breach of its fiscal responsibility to its sponsors and donors. 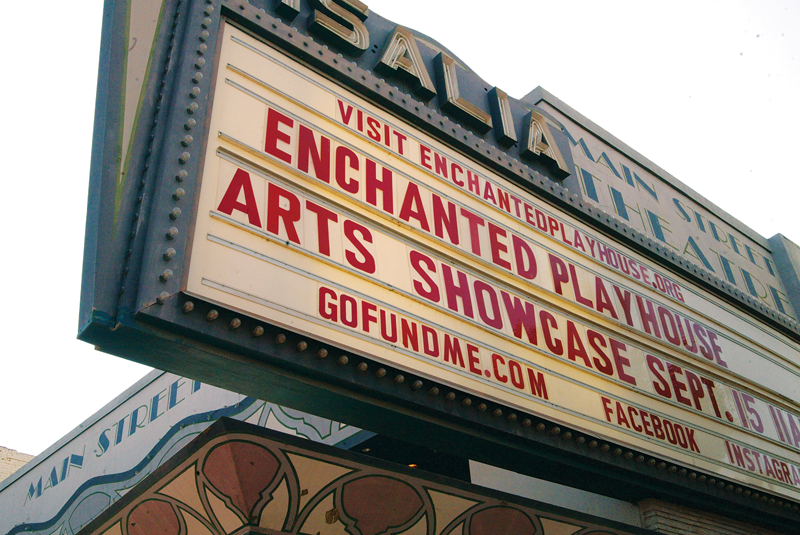 “It is the sincere hope of the Enchanted Playhouse that the City of Visalia will recognize the unique value of this theater company and will strive to work with the theater company to negotiate and develop a plan to benefit the children of our community,” EPTC stated in the letter. According to Link, EPTC proposed that the City financed nearly 100 percent of the group’s purchase of the building, and provided only a “nominal down payment.” The proposed loan was to be interest-only for five years and included vague references to grant funding for improvements. The proposed purchase price, even before the unspecified reductions, is below the requested minimum purchase price and below the appraised value. “The council gave Enchanted Playhouse a special opportunity to make a good faith proposal. The council felt this was not a good faith proposal,” said Link. In a recent letter to the City from the Enchanted Playhouse’s Fresno-based attorney, EPTC said its proposal was intended to be negotiable and that the theater company was prepared to agree to stipulations requiring them to enhance the property and provide additional entertainment acts in the downtown area. Enchanted Playhouse said it was going to submit a formal request for confidential negotiations. As a result, the vice mayor said the City was forced to initiate legal action to collect the $13,000 owed in missed rent payments. “The council is heartsick that we have gotten to this point. The hope was that the Enchanted Playhouse Theatre Company would purchase the Main Street Theatre, but they have not been able to make a realistic offer in the last fourteen years,” added Link. “Once they knew – a year ago – that there was other interest in buying the building, we hoped they would spend the past year aggressively fund raising so that they would be in a position to purchase the building. At the very least, the Council thought they would focus on the future and continuing their good work in one of the other six theatres available in our city,” said the vice mayor. In its response, EPTC said it “fully intends to honor all obligations” and will be working to repay past due rent. However, the theater company said this will be difficult after the City served EPTC with a 3-day eviction notice. EPTC’s letter goes on to state that the eviction notice will “severely impair” its fund-raising efforts, a vital part of the theater company’s ability to put on four shows per year at a cost of between $15,000 and $20,000. EPTC stated it was moving forward with its Enchanted Friends Performing Arts Showcase on Sept. 15 and a Run for Cover concert on Oct. 20, both scheduled to take place at the theater and Garden Street Plaza next door but may have to be moved. EPTC will certainly have to move it’s A Night of the Arts talent show event on Dec. 15 and its next play, “Once Upon Pandora’s Box,” scheduled to open Oct. 5 and run through Oct. 19. The theater company stated it has already scheduled performances at school sites throughout Tulare and Kings County with an estimated 1,500 children attending. “Without cooperation and serious negotiations with the City of Visalia, the theater company will be forced to turn these children away,” EPTC wrote. The City’s rejection letter ended with a timeline detailing the financial missteps by the Enchanted Playhouse. The timeline dates back to 1997 when the EPTC Board singed an agreement with the theater’s previous owners (Martin family) to lease the property for rent ranging from $2,300 per month in the first year to $3,281 in the fifth year. Six years later, the EPTC Board signed a performance agreement with the City to look at options for acquiring the Main Street Theatre, which was up for sale at the time, including a commitment to raise $100,000 or 20% of the negotiated price, whichever was greater, within a 12 month period. EPTC agreed to pay off the remainder through monthly loan payments, including reimbursement to the City for the costs to acquire the Theatre. The EPTC continued to be responsible for most of the non-structural maintenance. In 2004, the City acquired possession of the property from the Martin family. The EPTC Board signed a month-to-month lease agreement with the City for $3,000 per month. It took the City four years to acquire the title to the property through a lengthy court process, which ultimately established the purchase price at $600,000. Despite this higher than expected purchase price, the City continued to lease the property to EPTC for the same $3,000 per month. During the next eight years, the City invested more than $162,000 in maintenance and repairs, including major electrical upgrades and restoration of the marquee. In 2013, the EPTC Board was behind in rent by $25,000 and requested a lease modification. The City Council retroactively lowered their rent to $1,500/month, which reduced the debt to $12,000, a repayment plan of $500/month over two years, and the rent returning to $3,000 in 2016. Even at the reduced rent, the EPTC Board could keep up with payments. In November 2017, EPTC’s Board Treasurer sent an email to the City’s finance director agreeing with the City’s accounting that shows the theater company still owes more than $13,000. On Aug. 23, the EPTC attorney submitted a proposal for just $300,000, with a request for a reduced purchase price and for the City to carry an interest-only loan for five years with no plan for funding the restoration. It is expected that the City Council will consider the ordinance to sell the building to Legacy Investments.